The funding will support a diverse range of projects over the next two years including helping women at risk of homelessness or modern slavery to programmes that address problem gambling and violence against women. The money has been awarded to larger projects with around £7.5 million given to four projects making onward grants to small and medium sized organisations across the UK. It is absolutely right we invest money from sanitary products in projects to give more women and girls the help >and support they need to address difficult challenges they face in our society. This important funding will help thousands more vulnerable women of all ages across our communities. It will provide more of the opportunities they need to rebuild their lives. Over 70 charities have received grants from the Tampon Tax Fund, with £47 million allocated since the Autumn Statement in 2015. This additional £15 million brings the total to £62 million. Through the creation of a Tampon Tax Community Fund, the UKCF will deliver a UK wide onward grants programme to projects that will make a difference to the health, wellbeing, confidence and social and economic activity of women and girls. The grants will be awarded via an open competition. They will run an onward grants programme to provide direct support to women who are, or are at risk of, homelessness across England. Homeless women often have different needs and issues to men, and the project will produce and disseminate evidence-based learning and resources about the best ways to provide gender specific support to homeless women. This project called ‘The Carers Music Fund’ is a UK wide onward grants project that aims to increase access to music making for women and girls with caring responsibilities. This project is an onward grants programme investing in projects working to end violence against women and girls, particularly those who are more at risk due to multiple and complex needs. Through their Vulnerable Women and Problem Gambling Programme this project will develop better support for women and girls affected by problem gambling. Gamcare will work with a network of organisations to improve treatment options for women who are problem gamblers and women affected by domestic violence related to gambling. This project will help homeless women who are survivors of modern slavery rebuild their lives and find new homes. It will develop a model to identify and support the recovery of women who have escaped modern slavery and are homeless or precariously housed and help them into accommodation. Southall Black Sisters will provide support for women with no recourse to public funds through their ‘Recourse to Safety’ project. It will make essential support and protection available to abused women by providing safe accommodation, subsistence and help including counselling, therapy, immigration advice and community awareness-raising. Changing Lives’ ‘STAGE’ project will provide support for vulnerable women who have been groomed by groups of men for sexual exploitation in locations across the North East and Yorkshire. This project is a consortium of 12 organisations that aims to improve the number of young women accessing mental health support across England through their services. This will include a range of psychological therapies, group and one to one support, with a focus on young women with multiple needs and BAME young women. For more information call DCMS Press Office on 0207 211 2210. 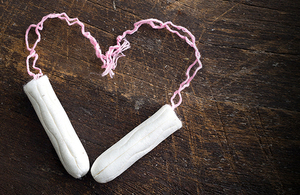 More information about the Tampon Tax Fund can be found here.